One simple cut of beef may have a handful of choices to choose from. With beef, the cuts of meat are plentiful which can leave anyone scratching their head. Learning about the different kinds of beef and what they are good for will help to take away the grocery store confusion. Beef has been a leader in the meat industry for many decades, but with so many choices and cuts to pick from, meat shopping can sometimes feel like an overwhelming experience. Some cuts work better than others do for various recipes depending on the way they are cooked. Learning about different cuts, and what they are best suited for is the key to preparing your perfect beef based dinner. Ground beef is typically used in to make things such as but not limited to hamburger, meat loaf, taco meat and meatballs. Although ground beef seems like the simplest meat choice, there are actually different variations of ground beef one can choose. 1. Ground Hamburger: Ground hamburger is usually a compilation of the less popular cuts of meat and other leftover pieces of other beef cuts. Ground hamburger may have fat added, but may not exceed over 30 percent fat per weight. 2. Ground Beef: This is primarily the same as ground hamburger, with the exception of fat content. While ground hamburger may have added fat, ground beef cannot. 3. Specialty Ground: Ground sirloin, ground chuck and ground round are all specialty cuts of ground meat. These packages only contain meat that was ground from that particular cut. There has been nothing added but the meat on the label. In many cases, specialty ground meats are leaner and more expensive than the typical ground hamburger and ground beef. If you do not find a specialty meat already ground, many grocery stores that have an in house butcher can grind any cut of meat for you on sight. 4. Lean/Extra-lean ground beef: Lean ground beef meets all of the requirements of regular ground beef, but is not allowed to have more than 22 percent of fat. Extra-lean ground beef must not exceed 15 percent of fat. Steak is one of the most well known, and eaten pieces of beef sold in the supermarkets. This cut of beef is best suited for outdoor grilling, but can be prepared successfully under a broiler as well. As with other cuts of beef, steak comes in many variations. Top of the line: Top loin, porterhouse, rib eye, tenderloin, top sirloin, flat iron, chuck eye and round tip are all considered premium pieces of steak. While these cuts are very tender, they are sold at a higher price than other cuts of steak. Cost Efficient: Cuts of meat that come from the more used parts of the cow may not be as tender as other cuts, but are still delicious pieces of meat. Bottom round, top round, eye round, full-cut round, chuck blade, chuck arm, chuck shoulder, chuck 7-bone, flank and skirt steak are all cuts of steak that are sold at a more budget friendly price. When cooked in a moist heat, these steaks can cook up just as tender as the more expensive cuts of steak. People have prepared different types of beef roasts for years. Many generally save this type of meat for special occasions and holidays, since roasts take more effort and time to prepare and cook. Because these cuts are larger than other pieces of meat, you can expect to pay more than you would on other cuts of beef. Cuts such as rib, rib eye, top loin and tenderloin are your premium roasts that are typically prepared for special occasions, since they cost more than other types of oven roasts. 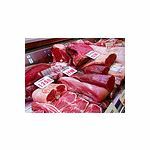 Round, bottom sirloin, tri-tip, round tip, rump, bottom round and eye round are all well suited for a family get-togethers and regular beef dinners, as they are leaner cuts that don't cost as much as others. These roasts cook well uncovered in the oven, or over the heat of a grill. Roast cuts that have a high fat percentage, such as chuck roasts are well suited for pot roast. Chuck cuts are less tender cuts of meat, which makes them perfect for pot roast. Pot roast is typically prepared under a low heat, high moisture setting which allows a tougher cut of meat, such as chuck, to fall off the bone tender. Chuck cuts are less expensive which makes it easier to enjoy a nice pot roast any time during the year. Stew meat is a popular comfort food that is an American past time. Cuts of chuck, round, brisket and rib work best for stew meat. When cooked in a moist pot over a slow simmer, these cuts of meat become extremely moist and tender. Stew meat is versatile, not to mention very affordable, which makes this cut of beef a favorite among those on a tight budget.